Byron opened it's doors on Putney High Street in June and despite being very frequent visitors to an NZ Burger chain we really we should give the "new boy in town" a try. 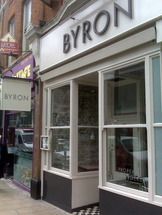 Byron is known in the catering industry as as a supplier of " up-market burger"(s) and the proof was in the taste - the 6oz burgers are juicy and are cooked medium unless otherwise requested and served with lettuce, tomato, red onion, pickle and mayonnaise - the classic starts at £6.50 and you can make it a double for an extra £3.75. The buns are soft freshly baked buns and for the carbohydrate cautious amongst you, you can order a "skinny" which has no bun but a side salad £7.25. The side orders include the choice of french fries £2.95 or "skin-on" chips£3.25, onion rings and coleslaw are also available plus a more unusual option (and they were tasty ) of Courgette fries £3.25. The lentil & mozzarella salad £8.50 was very tasty - although I would always prefer a burger - the wine choice is simple; four choices of red or white under the subheading "good", better", "great" & "best" - priced accordingly and simple to follow. The Argentinian Malbec Reserva, was the "great" and was very palatable. (£5.25 (175ml glass) / 6.75 (250ml glass) / 19.25 (750ml bottle)). 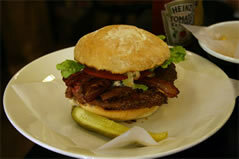 The kids approved of the chocolate milkshakes £3.95 - you certainly don't need a pudding after that and a burger! But there were four to choose from ranging from £3.95 for ice-cream or £4.75 for the others. Decor-wise Byron go for the bright retro look with a mix of small table and banquettes for the family. The front half is long and thin and the rear with views of the cooking opens out and was certainly full of large family groups plus a child's birthday lunch - the only downside for us was out table was by the w.c's which being a popular family restaurant proved to be rather too busy for a really relaxing meal - my tip avoid that table!!! The final bill for the family of four was £66.25 excluding service.